With Gucci off to Paris for a season, there was space to fill, but only a few brave designers rose to the challenge. MILAN, Italy — Milan fashion week keeps suffering. Of late, it has attracted an unshakeable and only partly deserved reputation for being unchallenging, which is, in fact, a problem affecting today’s fashion world as a whole. But mud is thrown at Italy. The New York Times investigation on unregulated home work in Italy’s luxury goods supply chain, landing on the front page of the newspaper on the second day of Milan fashion week, caused such a stir that the Camera Nazionale della Moda Italiana replied with an official statement of denial and support. But nonetheless the cycle of shows which closed yesterday was indeed problematic. Just like London and New York before it, Milan was, frankly, unimpressive. The trouble began early when Gucci, the Italian brand with the most gravitational pull, announced it would decamp to Paris for one season. Despite Albert Einstein's belief that a crisis is the best thing that can happen to people, because crisis brings progress, the sent most Italian fashionistas into panic mode, including the Camera della Moda, which farcically included Gucci’s Paris show on the official Milanese calendar. What for? If Alessandro Michele is out for a season, what a better opportunity to outdo him or at least try? Yet only a few dared: a select bunch of brave designers, old and new, big and small, keeping Italian fashion in good health. Francesco Risso is one. He keeps honing his unique child-like signature at Marni. His loosely constructed collection of deconstructed ladylike shapes and liquid drapes was a winner. Risso's way with raw cuts and incorporations of the sartorial process into the product owes a lot to Martin Margiela, for sure. His proclivity for brutally attacking certain tropes of bourgeois dressing, on the other end, reflects a debt to his alma mater Prada. The mix of the two aspects, however, is completely his own. Risso behaves like a child running havoc in the atelier, but there is both instinct and sophistication to his method. The Marni woman, in his hands, has drastically changed while remaining the same, if you allow me the contraction: she's now kooky yet uptight, artistic and fierce, trying a bit too hard but nonetheless compelling. The way Risso decoded and destroyed ladylike tropes felt particularly on point this season because of the widespread conservativism seen elsewhere. Even a modernist like Alessandro Dell'Acqua embraced womanly restraint at N.21 after years of street-worthy style clashes. On the more seasoned side of the fashion spectrum, Missoni turned 65 showing no signs of fatigue. The story of this brand is a telling one: with its knits, fiammatos and zigzags, Missoni is always the same yet always different, which if you ask me is also a wonderful metaphor for the contradictions of fashion itself. At Missoni, continuity and disruption mingle and merge endlessly. Just like most designers reacting to the harshness of today's world, Angela Missoni was drawn to escapism this season, sending a posse of travelers in tour from the Andes to Japan to the moon, crossing worlds in gauzy, gossamer, iridescent and featherweight textures. Finding a connection between distant civilizations that was primarily aesthetic, Missoni dished out a message of harmony that felt refreshingly political, all the while delivering a catchy succession of separates that just demand to be further mixed and matched. Working with historic brands with a precise DNA and trying to update them in meaningful ways is not an easy task, but both Luke and Lucie Meier at Jil Sander and Paul Andrew and Guillaume Meilland at Salvatore Ferragamo dealt with it well, delivering the easy and timely classicism that Italian fashion does best. Italian designers are not good at concept; they are good at product — nuanced, rich in references and wearable. The Meiers added a dash of abstraction at Jil Sander, while Salvatore Ferragamo was strong on painterly color. 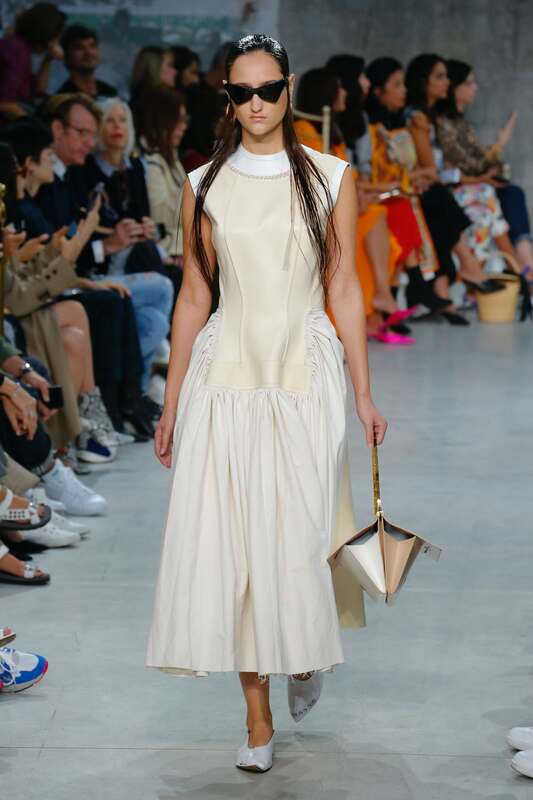 Another collection worth mentioning that was also an example of a soulful Italian classicism is Agnona, where Simon Holloway keeps perfecting a delightful recipe of loose shapes, fabulous hues and hyper-luxe fabrications. Nothing to do with The Row if you ask: there is a sense of dynamism and mindful presence to Holloway's way that is delightfully real, not monastic. Otherwise, this season would have been a good time for the eternal debutantes to finally make a ballsy statement and get out of the designer-on-the-verge-of-turning-big limbo, but it didn’t happen exactly. 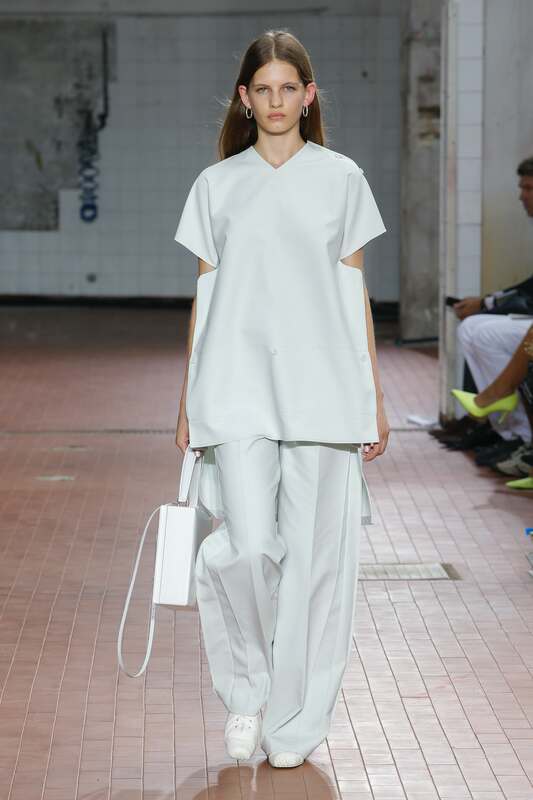 Gabriele Colangelo, for instance, keeps warming up an idea of artsy minimalism, and delivered a good if a tad too Céline-like collection, yet what was truly lacking was frisson. Marco de Vincenzo has been lingering in grey territory for a few seasons now. He should let go of all his insecurities, embrace psychedelia and just be bold, because he has quite a vision. Instead, he played it safe, and the result was boring. MSGM was disappointingly lukewarm, too, while Arthur Arbesser was braver. At least, the Austrian transplant tried to break up his own code and inject a lively and chaotic spirit. Still, Arbesser needs to find a balance between the 2d and the 3d, reconciling the dress as a graphic experiment with the dress as a wearable object meant to be worn by a living and moving body. The main problems of this Milan Fashion Week were two fold. The first was the calendar. Camera della Moda really needs to fix it. The Gucci debacle shortened the duration of fashion week and that is okay but packing too many shows and presentations into each day makes no sense. Furthermore, Italian institutions need to nurture talent the way the French do: balls out. Squeezing a small but promising label like Calcaterra in between Sportmax and Etro was a bad move, just like having Tiziano Guardini, a stalwart of intelligent sustainability, right before Fendi. Throwing the little pearls we have in the dust is silly. The second problem is way more substantial: it is the fact that basically the Italian fashion microcosm reflects the troubles of Italy as a whole. We are not living our best moment: generational turnover is at a standstill and social mobility has ground to a halt. Fashion is just the same. There are the big players, with their lavish budgets and power over the media, who steal the scene, leaving no room for anybody else. Don't get me wrong: Armani, Prada and Dolce & Gabbana have big businesses, and have earned their stripes. These brands are at the very top because they deserve it. Still, they should not completely dominate the scene. These are brands that capitalise on a code and innovate very little, even when they appear to. 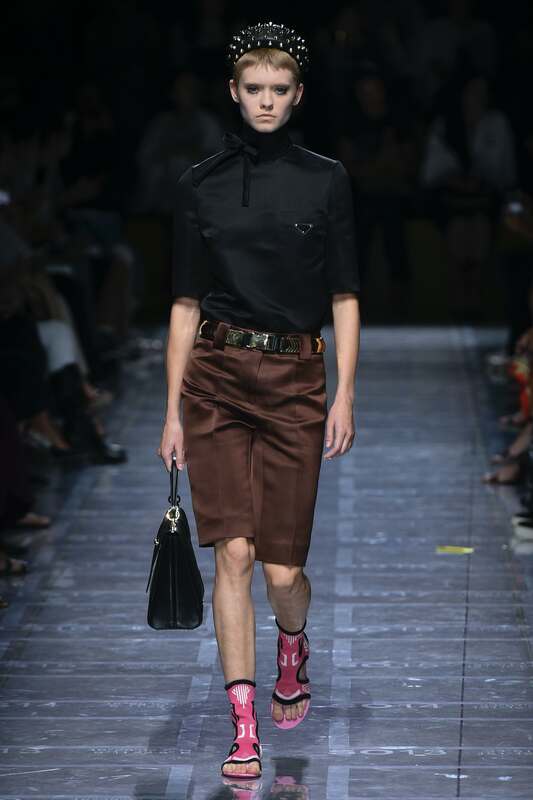 Prada is an example: Miuccia Prada has been refreshing or should I say reshuffling her repertoire of late. Yet the big players have the bigger budgets. Armani's Linate extravaganza was a smashing, once in a lifetime event, just like Prada's ugly chic reenactment in the belly of the Fondazione was captivating and Donatella Versace's new homage to the Versace heyday was catchy. Yet, we Italians have to work towards building the social awareness that there is life, and creativity elsewhere. There are not that many talents around, but there are seeds that need to be cultivated. We have to allow the smaller players time to become big, otherwise nothing will happen. In this sense, Act n.1, the label founded by Chinese-Italian Luca Lin and Georgian Galib Gassanov, made a noteworthy debut that almost passed under the radar. The two are certainly raw and need a bit of fine tuning, but they have talent and energy. The concept of their show was a critique of the child bride plague, which Gassanov knows well because of his Georgian roots. Of course, making political statements of this kind using fashion is extremely dangerous, as it can glamorize a problem, making it empty. Yet, Lin and Gassanov overcome the issue with sincerity and spontaneity. The show should have done without the tears make up and the chains and some tulle, but there was some fierce dressmaking. The two are the kind of designers that, elsewhere, would get propelled to the top of Mount Olympus in a second. Their focus and dedication provided hope for what otherwise seems a wasteland.